After serving as a United States representative and being repeatedly re-elected as United States senator from Kansas, Curtis was chosen as Senate Majority Leader by his Republican colleagues. A member of the Kaw Nation born in the Kansas Territory, Curtis was the first person with significant Native American ancestry and the first person with acknowledged non-European ancestry to reach either of the highest offices in the Federal Executive Branch, and is still the highest-ranking enrolled Native American ever to serve in the federal government. He also was the last Executive Branch officer born in a territory rather than a state. His mother was Native American of mixed Kaw, Osage and French ancestry. His father was of British origins, being half- English, a quarter Scottish and half- Welsh. Curtis read law in an established firm where he worked part-time. He was admitted to the bar in 1881,  and began his practice in Topeka. He served as prosecuting attorney of Shawnee County, Kansas from 1885 to 1889. On November 27, 1884, Charles Curtis married Annie Elizabeth Baird  (1860–1924). They had three children: Permelia Jeannette Curtis (1886–1955), Henry "Harry" King Curtis (1890–1946), and Leona Virginia Curtis (1892–1965). He and his wife also provided a home in Topeka for Dolly Curtis before her marriage. His wife died in 1924. Curtis resigned from the House after having been elected by the Kansas Legislature to the U.S. Senate seat left vacant by the resignation of Joseph R. Burton. Curtis served the remainder of the current term, ending on March 4, 1907. (Popular election of US senators had not yet been mandated by constitutional amendment.) At the same time, the legislature elected Curtis to the next full Senate term commencing March 4; he served until March 4, 1913. In 1912, Democrats won control of the Kansas legislature, so Curtis was not re-elected. Curtis was celebrated as a "stand patter," the most regular of Republicans, and yet a man who could always bargain with his party's progressives and with senators from across the center aisle. Curtis received 64 votes on the presidential ballot at the 1928 Republican National Convention in Kansas City, out of 1,084 total. The winning candidate, Herbert Hoover, secured 837 votes, having been the favourite for the nomination since August 1927 (when President Calvin Coolidge ruled himself out of contention). Curtis was a leader of the anti-Hoover movement, forming an alliance with two of his Senate colleagues, Guy Goff and James E. Watson, as well as Governor Frank Lowden of Illinois. Less than a week before the convention, he described Hoover as a man "for whom the party will be on the defensive from the day he is named until the close of the polls on election day". However, despite his opposition, Curtis had no qualms about accepting the vice-presidential nomination. Curtis's election as vice president made history because he was the only native Kansan and only Native American to hold the post, as well as the first person of acknowledged non-European ancestry. The first American of significant Native American ancestry to be elected to such high office, Curtis decorated his office with Native American artifacts and posed for pictures wearing Indian headdresses. He was 69 when he took office, making him the oldest incoming vice-president at the time. He is now the second-oldest, behind Alben W. Barkley at 71. After the stock market crash in 1929, the problems of the Great Depression led to the defeat of the Republican ticket. Democrat Franklin D. Roosevelt was elected in 1932 as president, with a popular vote of 57% to 40%. Curtis's term as vice president ended on March 4, 1933. Curtis's final duty as vice president was to administer the oath of office to his successor, John Nance Garner. Garner's swearing-in ceremony was the last to take place in the Senate Chamber. Curtis was 73 years and 38 days old when his term as vice president ended, making him the oldest VP in history until Vice President Alben W. Barkley surpassed him on January 2, 1951. He died there on February 8, 1936 from a heart attack. By his wishes, his body was returned to his beloved Kansas and buried next to his wife at the Topeka Cemetery. He was featured on the cover of Time magazine, December 20, 1926  and June 18, 1928, while serving as US Senator from Kansas. Full-length articles discussed his life and politics. ^ McKie, Scott (February 4, 2014). "Charles Curtis: America's Indian Vice President". Cherokee One Feather. Retrieved June 20, 2016. ^ "January 29 – This Date in History: Kaw Member Charles Curtis Becomes US Senator". Native News Online (29 January 2014). Retrieved June 20, 2016. ^ "Genealogy of Vice President Charles Curtis – Mother's side: Pappans (of Charles Curtis)". VPCharlesCurtis.net. Retrieved July 19, 2010. ^ a b c d "Charles Curtis, 31st Vice President (1929–1933)". U.S. Senate: Art & History. US Senate.gov. Retrieved December 14, 2011. , reprinted from Vice Presidents of the United States, 1789–1993. Washington, DC: US Government Printing Office. 1997. ^ a b United States Congress. "Charles Curtis (id: C001008)". Biographical Directory of the United States Congress. ^ a b "The Congress: Quiet Leader". Time. December 20, 1926. Archived from the original on December 20, 2008. Retrieved December 30, 2009. ^ a b c "Obituary". Kansas City Star. February 9, 1936. Quoted in J.R. Mendoza (March 23, 2003). "Charles Curtis: Doing it his way". Topeka Capital-Journal. 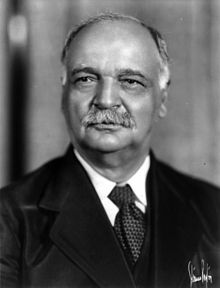 ^ "U.S. Senate: Charles Curtis, 31st Vice President (1929–1933)". www.senate.gov. ^ "Our Campaigns – US Vice President – R Convention Race – Jun 14, 1932". www.ourcampaigns.com. ^ "Former Vice President, Charles Curtis. Succumbs". Southeast Missourian. February 8, 1936. p. 1. Retrieved August 13, 2011. ^ "Senator Charles Curtis". Time. June 18, 1928. Archived from the original on November 21, 2010. Retrieved December 30, 2009. ^ "Lamest Duck". Time. December 5, 1932. Archived from the original on April 2, 2009. Retrieved January 21, 2010.